UPPRPB Admit Card 2018: Uttar Pradesh Police Recruitment and Promotion Board has announced yet another recruitment drive for 49,568 Constable posts. The candidates interested were required to apply from 19th November 2018 to 8th December 2018. The candidates have completed their payment process till yesterday that is by 10th December 2018. UPPRPB has published UP Police Admit Card for all the candidates whose applications are successfully accepted. 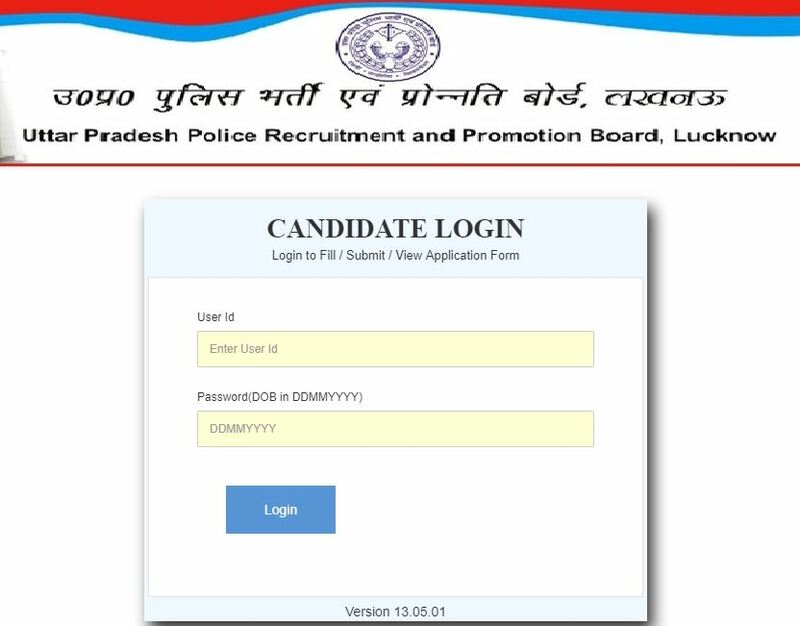 The candidates can visit the official website (http://uppbpb.gov.in/) and download UP Police Constable Admit Card 2018. Read the complete article to find all necessary details about UPPRPB Admit Card 2018. 23/01/2018 Latest Update: UP Police Constable Admit Card for the examinations due on 27th & 28th January 2019 has been released. The candidates can download the Admit card from the provided link below. 28/12/2018 Latest Update: UP Police Constable Recruitment 2019 has postponed the Exam Dates further to 27th January 2019 and 28th January 2019. The UP Police Admit Card 2019 is expected to release by 20th January 2019 (expected). Check the image below to read the notice. 13/12/2018 Latest Update: UP Police Constable Recruitment 2019 has announced the New Exam Schedule. The exam has been postponed from 4th & 5th January 2019 to 19th January Onwards. Check the image below to confirm the news. Exam Schedule has been updated below. UP Police Admit Card will soon be releasing on the official website of UPPRPB. The candidates are being provided with all the important details of the recruitment drive and UP Police Admit Card 2018. It is important to note all the aspect of the recruitment before you proceed with the selection process. The candidates are advised to bookmark the page in order to receive the latest updates from UPPRPB. Below are given the examination dates for the Written exam. 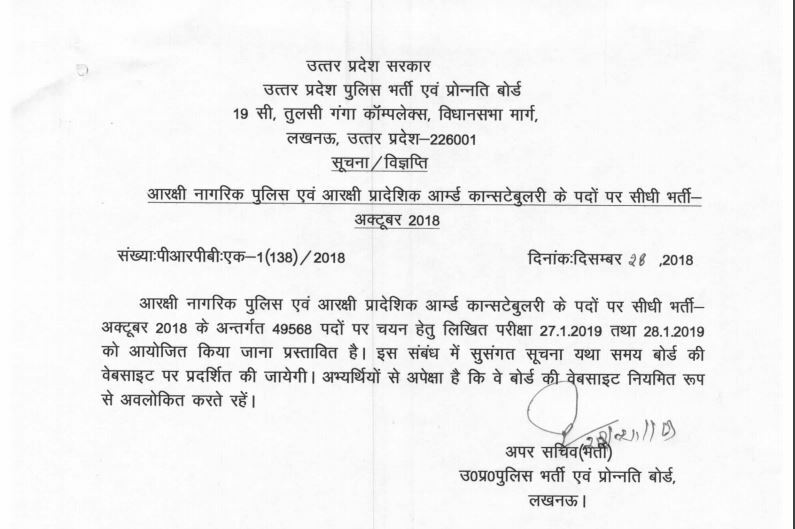 UP Police Exam Dates are confirmed through an official notice. The notice has been uploaded above. Check the Exam Dates & Shifts for UP Police Constable Written examination 2018 -19. UP Police Constable Phase II Admit Card 2018 will soon release on the official website of UPPRPB. The candidates have already applied for the recruitment. The Board will now scrutinize the UP Police Applications and select the candidates who are eligible to appear for the examination. In case of discrepancy or false information in the Application Form, it will be rejected. उप पुलिस एडमिट कार्ड 2018 will only be released for the candidates who have successfully submitted their applications and are selected as eligible by the board. UP Police Admit Card acts as an Identity Proof for the candidate. No candidate will be allowed to appear or enter the Examination venue without UP Police Hall Ticket. Confirmed dates for the UPPRPB Admit Card 2018 Release will soon be intimidated to candidate here. The candidates should make sure that the admit card is correctly printed and is available with them in due time. An admit card is an authority letter that authenticates the candidate to appear in the examination. Admit Card proves that the candidate appearing in the exam is eligible to appear in the examination. Keep your UP Police Admit Card in proper condition, that is it must not be soiled, torn or creased unnecessarily. The UP Police Constable Admit Card (प्रवेश पत्र) will soon be released. Candidates can check the following procedures to download the UP Police Constable Pahe II Admit Card 2018. STEP 5: Enter the required details- Registration Number, Password and Date of Birth. STEP 6: The UP Police Constable Admit Card 2018 will be displayed on the Screen. STEP 7: Take the Print out of the उप पुलिस प्रवेश पत्र 2018 and keep it safe until the completion of the recruitment procedure. If there is any sort of discrepancy found in the UP Police Constable uppbpb.gov.in 2018 admit card, then contact the concerned authorities regarding the corrections to be made in the Admit card. Identity Proof such as Aadhaar card/ Voter ID Card/ Driving License / PAN Card etc. The examination for UP Police Constable II will be conducted online. The Exam pattern will be released later which will be updated here. By the time we are providing the UP Police Constable Phase II Syllabus PDF here. The candidates can download the PDF File here and start their preparation. Soon through an official notice, UPPRPB will announce the UP Police Constable Phase II Exam Dates on its official website. As soon as the dates are announced we will bring you the latest updates thus the candidate would be able to gear up their preparation ahead of time. We advise you to be in continuous contact with the website. We will bring the recent updates as soon as they are available. The Board conducts Physical Efficiency Test, to recruit candidates for Resident Citizen Police & Reserved Territorial Armed Constabulary Direct Recruitment 2018. In this article, we have provided the list of the details that are required for the Physical Efficiency Test of UP Police Constable Phase II 2018. A Separate Admit Card will be released for Physical Efficiency Test. The candidates will receive the Admit Card after they clear DV/PST Exam on the spot. Candidates have to run for 4.8 Kms in 25 minutes for male candidates and 2.4 Kms in 14 minutes for female candidates. The Exam will be conducted in more than 8 places in Uttar Pradesh. The Physical Efficiency Test is qualifying in nature and has nothing to do with the merit list. Candidates must complete the physical test. Candidates who do not complete the run within the prescribed time, will not be eligible for the next stage of the examination. CCTV coverage and Biometrics with adequate backup are used to ensure accuracy, transparency and to avoid impersonation. Ankle Based RFID Technology will be used for the evaluation of the candidate. Necessary accessories will be provided to each candidate by the candidate. Each and every candidate will be assigned with a Unique serial numbered jacket or similar apparel, displaying the number on this chest as well as on his back. The Biometric Registration of the candidate will be done by the agency. The processed data of each day tests will be uploaded at the Board’s website every day in the prescribed Format. Objections raised by the candidates shall be resolved by the agency under the supervision of Official deputed for this purpose. The candidates who had not appeared for the PET exam earlier were given recent dates. Kindly check your login again for the admit card. Appear for the test as stated. Though as of today, the examinations for the PET exam are over. Jaise hi koi naya update aata h to hum aapko zaroor inform krenge. PET Admit Card release hone dijiye. Abhi UP Police Admit Card for written test release ho ga.
Kindly wait for the Admit Card to be released. The Link will be updated soon. Purani UP Police Constable Recruitment ka Physical already conduct ho chuka hai. Ye new Recruitment hai. Jiska Application Form 8th December tak fill ho chuka h. Admit card sirf unhi candidates k liye avialable hoga, jinhone apply kioya h.